The Tensaw-Apalachee Watershed covers over 37,000 acres in Mobile and Baldwin Counties. Portions of the watershed drain the highly urbanized areas of downtown Mobile as well as Spanish Fort and Daphne along the eastern shore of Baldwin County. Land use breakdown: 21% urban, 3% agricultural land, 9% forested, 26% water/wetlands. Tensaw-Apalachee River (HUC 031602040505). This watershed represents the lower portion of the Mobile-Tensaw delta and the confluence of the Mobile, Spanish, Tensaw, Apalachee and Blakely Rivers at the head of Mobile Bay. The watershed also includes tributaries associated with the D'Olive Creek subwatershed which empty into D'Olive Bay and Mobile Bay alon the eastern shore of Baldwin County. All of these areas are tidally influenced. ADEM's water use classifications within this watershed include Swimming & Whole Body Contact, Fish & Wilflife and Outstanding Alabama Water. The OAW classification for the Tensaw River extends from the confluence of the Tensaw and Apalachee Rivers to Briar Lake. Multiple stream sections within the watershed are listed as impaired for atmospheric deposition of mercury. Also, 5 stream segments within the D'Olive Creek subwatershed were placed on the 303d list in 2008 due to siltation caused by rapid development within the watershed. In addition to listed impairments, another primary concern is the impact that the Mobile Bay Causeway has on hydrology and ecosystems of the lower delta/upper bay. The WL Holland Wildlife Management area and over 1,500 acres of the Mobile-Tensaw Delta tract (part of the State's Forever Wild public land trust) are managed by ADCNR as a nature preserve, recreation area and wildlife managment area and provide access to excellent hunting, fishing, boating, birdwatching, camping, and other activities. The Mobile Bay Causeway provides multiple access points including public and private boat launches, private fish camps, public fishing access, and also access via Battleship Memorial Park, 5-Rivers Delta Resource Center and Meaher State Park. The Mobile Tensaw River Delta is a complex network of tidally influenced rivers, creeks, bays, lakes, wetlands and bayous and was named a National Natural Landmark by Congress in 1974. 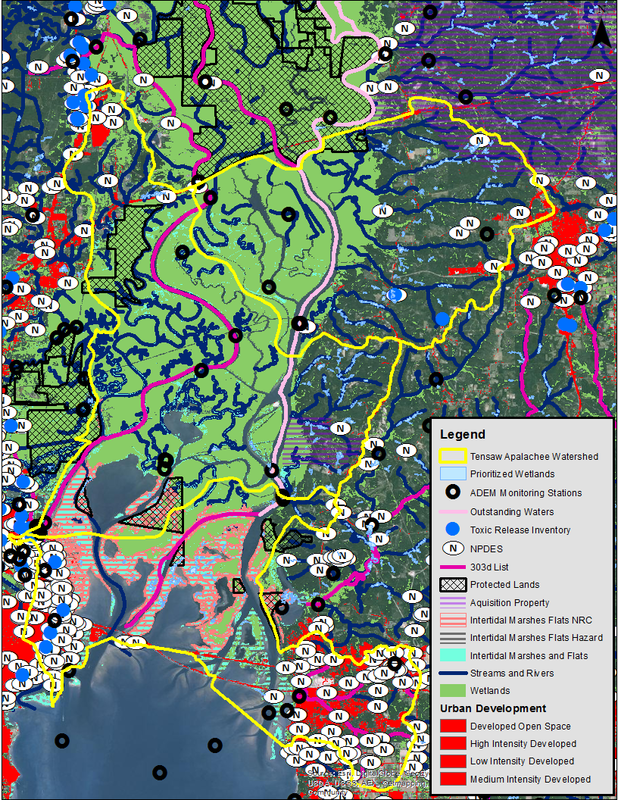 The Delta system represents one of the most ecologically, culturally and economically significant wetlands in the nation and includes priority habitats identified by the MBNEP (freshwater wetlands and intertidal marshes and flats). The estuarine habitats within the watershed support numerous recreationally and commercially important species of finfish, shellfish as well as waterfowl. USFWS documented T&E Species: Florida manatee (Trichechus manatus latirostris), Alabama red-bellied turtle (Pseudemys alabamensis), Gulf sturgeon (Acipenser oxyrinchus desotoi) and American bald eagle (Haliaeetus leucocephalus).